Nearly 800 riders will descend on the beaches of south Wales for the annual Battle of the Beach mountain bike race. 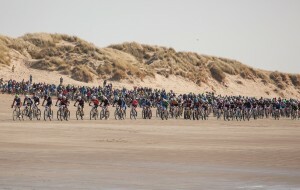 This is the third year the event has run and it sees riders tackle three laps of a 15 kilometre route that begins on the soft sands of the Cefn Sidans beach then hops over the sand dunes into a network of singletrack trails. The Dutch are the masters of beach racing and you can expect current World Champion Bram Imming to be in attendance. He will be challenged by a strong contingent of local riders, however only one native Brit as ever won this race – Melanie Alexander in the Open Women in 2015. She will face some stiff competition defending her crown though as the £2,000 cash prize for first place is the biggest in off-road cycling. The event always attracts a mish-mash of different riders with XC bikes, fat bikes and cyclocross bikes being ridden in equal numbers. However, there is always a very inclusive and open atmosphere no matter what you ride. Unfortunately entries have totally sold out for the event but you can still go and spectate for free or volunteer on the day to get close to the action.